The Australian Men’s Shed Association (AMSA) is the peak body supporting almost 1000 Men’s Sheds and is recognised as one of Australia’s largest male-based community development organisations. 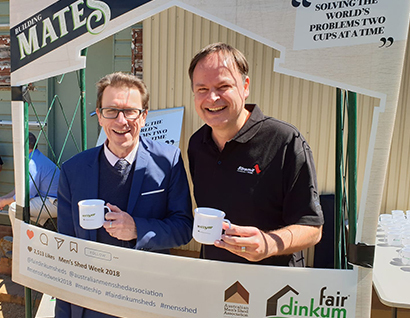 Fair Dinkum Shed’s is a long-term partner of AMSA and supporter of Men’s Shed Week. Men’s Shed Week is an annual event led by the AMSA to highlight the contributions of Men’s Sheds to their members’ health and wellbeing and to the wider community. Men’s Shed Week activities and messages aim to bring to life the diverse nature of male friendships and the spirit of loyalty and comradery that is built on the foundations of the Men’s Shed. In 2018 the Men’s Shed Week theme was celebrating “mateship”. To raise awareness and promote the benefits of mateship across the Men’s Shed Community, we produced branded Coffee Mugs to encourage ‘mateship” by having a coffee with a mate, along with sponsorship Pull-up banners and Tear drop banners to be displayed at the events across rural NSW.